HELPS ENERGY METABOLISM & YIELD – Biotin is known to breakdown macronutrients fat, carbohydrates & protein to produce energy & reduce fatigue. ENCOURAGES HAIR GROWTH – Biotin is one of the leading hair growth and regrowth supplements. Encouraging thick and healthy hair development. BOOSTS THE NERVOUS SYSTEM – Biotin not only boosts energy but invigorates the nervous system, thus promoting enhances physiological function. 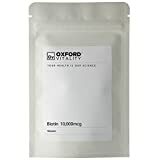 Biotin tablets from Oxford Vitality. Biotin is classified as one of the water soluble B-Vitamins (B7), but is most commonly referred to as “Biotin”. It took 40 years from discovery for Biotin to be recognised and named as a vitamin and an important one at that. Biotin (B7) is required in all living organisms. Some gut bacteria has the ability to produce Vitamin B7 in very small amounts, but this is subject to disturbances in the intestines or caused by antibiotics. Biotin is considered essential, and so, must be consumed through the diet. Biotin (B7) is found organically in foods such as eggs, oats, salmon and liver, and in plants such as onions, tomatoes, carrots, peanuts, walnuts, sweet potato and Saskatoon berries. Biotin contributes to normal energy and macronutrient (Fat, Carbohydrate and Protein) metabolism, adequate physiological function and health of the nervous system. It’s also been shown that Biotin can help to maintain normal skin, hair and mucous membranes. Biotin is often suggested for use when a person’s food intake it not adequate and although uncommon, it is most likely to occur in pregnant women or people that consume vast amounts of egg whites per day. Oxford Vitality offers two strengths of 5000mcg and 10000mcg per tablet in 6 different sized quantities, 30 to 1000 Tablets . This allows you to choose the quantity most appropriate for your needs. The tablet size is small, 6mm in diameter, with a weight of 150mg, which is very easy to swallow, for your comfort. This product is suitable for vegans and vegetarians.